NEW YORK—Libraries have always been important to their communities, but in New York City the past five years have been a period of reinvention. Not because their popularity began to wane—quite the opposite. In 2011, New York City libraries had more than 40.5 million visitors. The city’s library network is divided between three systems: New York Public Library, Queens Library, and Brooklyn Public Library. Today, despite repeated budget cuts since 2008, the 212 public libraries throughout the city’s five boroughs are more than just books—they are powerhouse public service providers. “Our elected officials say they hear from library users more than anyone,” said Anthony Marx, president of the New York Public Library (NYPL) during a recent interview. Marx was speaking from the mid-Manhattan Library, one of the busiest library branches in the country. The voices of concerned constituents have become key in recent years, as the Bloomberg administration repeatedly cuts library funding. Widely known as the “annual budget dance,” every year the city’s fiscal budget presents huge budget cuts to libraries that are eventually mostly restored. Though the majority of the cuts are typically restored by the City Council, according to testimony given by all three library presidents, libraries today are $57 million below 2008 funding levels. That’s an 18 percent decrease in funding in five years. The part that the library presidents have repeated over and over during the current fiscal year budget debates, which are set to end sometime in mid-June, is that they are doing more with less, and less. That means computer literacy classes, free programming for families and kids, ESOL classes, helping job seekers, after school and out-of-school programming, and promoting job creation and entrepreneurship. In fact, the demand has never been stronger. 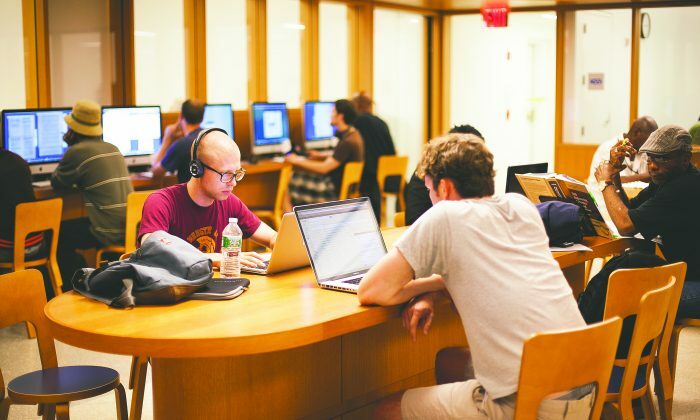 In the past decade, library use throughout New York City has dramatically increased, according to a January 2013 report by the Center for an Urban Future. The report shows that over the past decade, libraries have increased program sessions by 24 percent, program attendance by 40 percent, and circulation by 59 percent. During the 2013 budget dance for the coming fiscal year’s budget, $106.7 million has been on the chopping block. In their testimony in a June 3 hearing, the library presidents (who testified jointly) brought up the example of another world-class city that has taken a different route. In Washington, D.C., City Councilman Jack Evans led a charge against cuts there that had shut down libraries on the weekend. Evans decided he’d had enough. He approached the head of the D.C. library system at the time, Ginnie Cooper, and asked how much it would take to keep libraries open after hours and on weekends. He found out he needed $10 million. Putting his full weight behind a bill for the funding, Evans said he just started to talk about libraries everywhere he went, and “it started to gain steam.” The bill was passed unanimously and most of the funding and hours were approved. Though the size and scale of the systems in D.C. and New York City are vastly different, Evans said change is possible with the right champions. “We need to understand that libraries are a primary institution for education, from cradle to grave,” said Marx, who adds that for many it is a lifeline resource.